This entry was posted in Announcements, Music play, Outdoor play, PreK + K Sharing and tagged blogging, Child's Play Music, classroom music, early childhood education, music play, music stations, outdoor play by Alec @ Child's Play Music. Bookmark the permalink. Lesley, I realise that in this brief post I’ve given the impression that I think the outdoors is the only place for music play – and that was certainly not my intention. I believe the outdoors is often the best place for music play, but music should be available both indoors and outdoors, & in both free choice time and in more organised mat or circle time. A good music program uses all the environment and provides many different types of activities and play opportunities. In the full blog post on PreK + K Sharing I’ve gone into more detail about this, but I hope I haven’t discouraged anyone from providing music indoors! My post was meant to extend music play ideas, not narrow them. 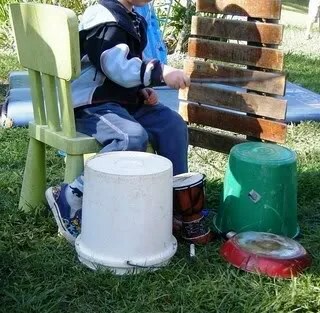 I’ve gone back and edited the PreK + K Sharing post to make it explicit that I’m offering these ideas to extend the music program outdoors, not to replace the indoor component. Thanks for your feedback – it’s really helped me to improve the post!